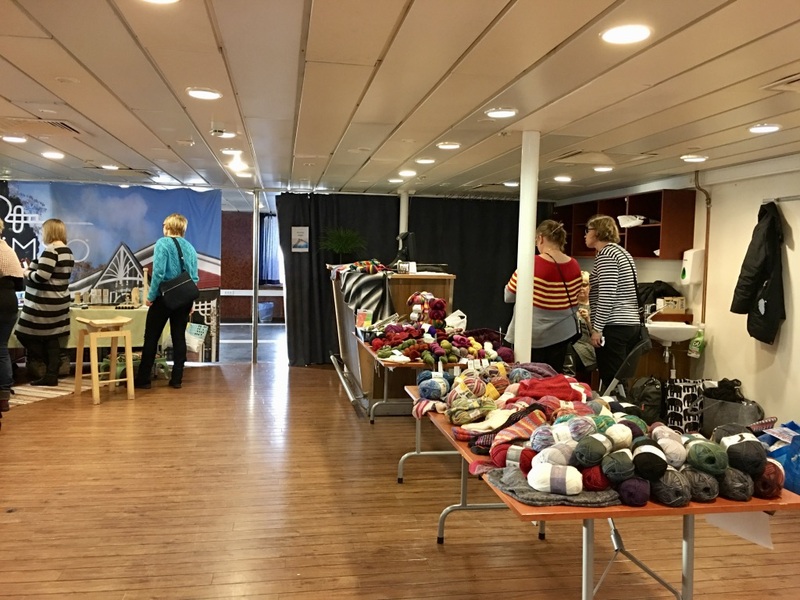 Yesterday I went on a trip to Sweden: there was a craft cruise from Vaasa in Finland to Umeå in Sweden. I didn’t take any workshops, but went to a talk and met a lot of old and new friends. I also stumbled upon a second cousin of mine and his wife who live only a mile away here in the same village. 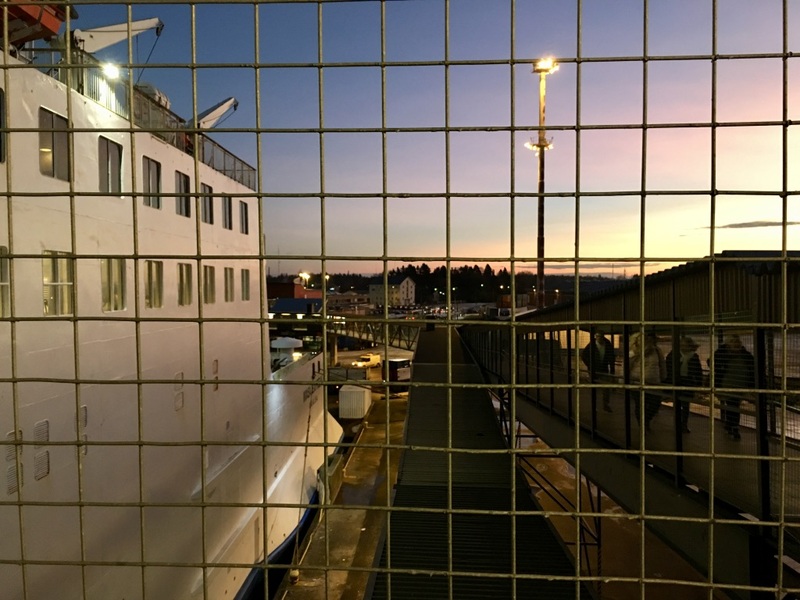 That’s inevitable: the ferry from Vasa to Umeå is very popular, even if it can’t reach the levels from the tax free period before EU. I often think that if I hadn’t been so interested in textiles, I would’ve turned to wood. 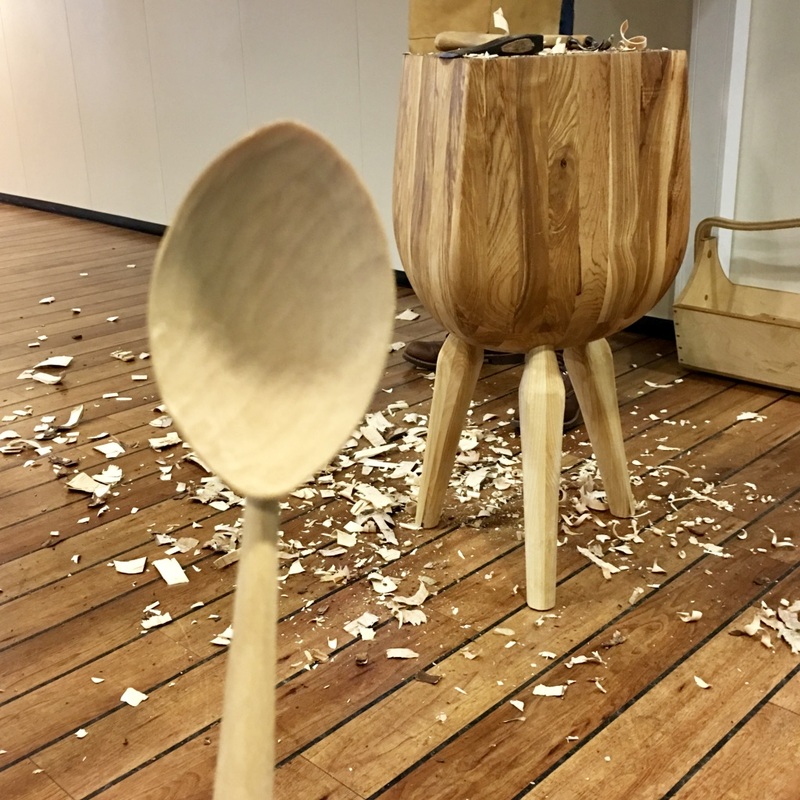 So I thoroughly enjoyed watching how Andreas Söderlund made a spoon from what hubby and I would burn in our wood stove. Andreas has made the chopping block himself. This was a talk, not a workshop. I think handing over very sharp axes and knives to a bunch of eager ladies onboard a ferry isn’t permitted! After Sliperiet we walked to the city centre, where I met up with my friend Carina. 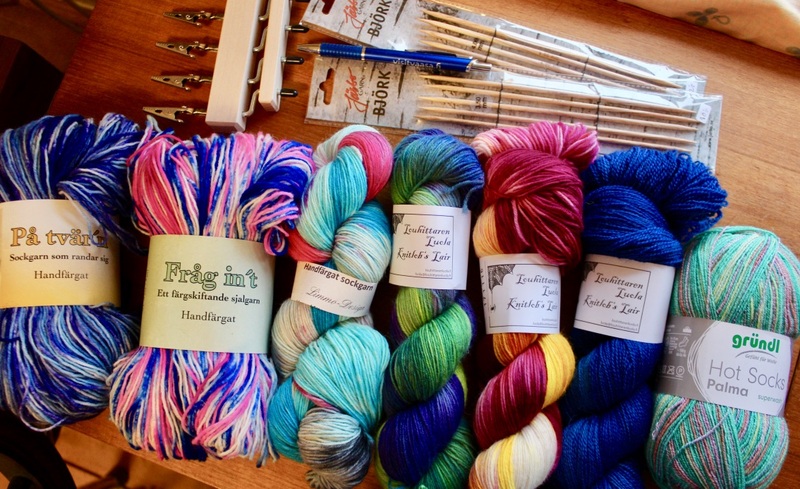 She had filled a goody bag with locks from her Dala Pälsfår (a rare Swedish sheep breed), lambs wool also from her sheep in the plastic bag, and Cheviot dyed by her. The bigger jar contains leather grease made by Carina, and the smaller one is filled with the best lip balm I know, also made by her. The eggs are from Carina’s hens. Yes, they are delicious! I made a 4-egg omelette for hubby and me for lunch today. Back on the boat I bought two skeins of hand dyed sock yarns from Tuulia of Knitlob’s Lair and a bright blue skein of lace yarn spun from Finnish landrace wool, and from Lillemor of Limmo-Design I bought a skein of turquoise-pink sock yarn. From Pirjo-Liisa of Neulenettikahvila I bought an interesting yarn with wool, cotton and polyamid that I want to test in socks this spring and summer. I also bought a fringe twister, and sock needles made of birch (Limmo-Design). All three ladies on the boat where quite happy with their day as they sold a lot of yarns. 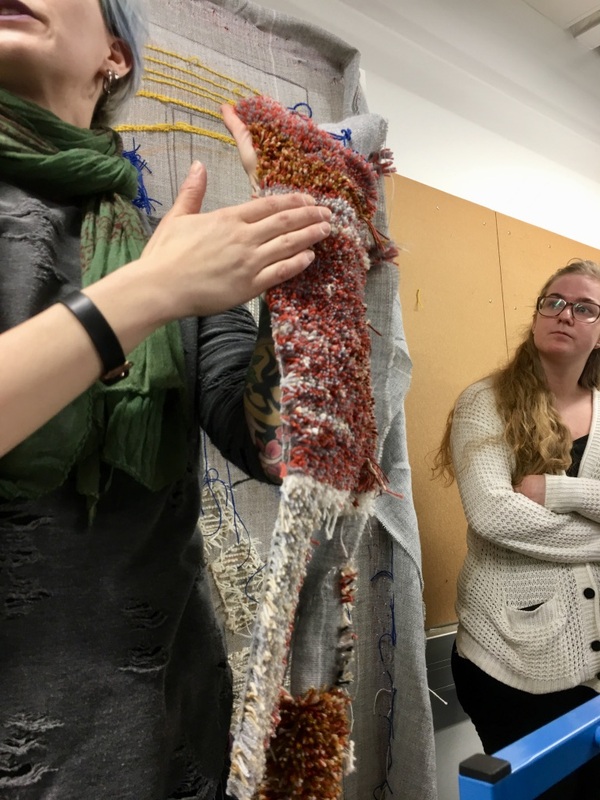 Now, how many of you would like to take a first spindling class in front of an audience? 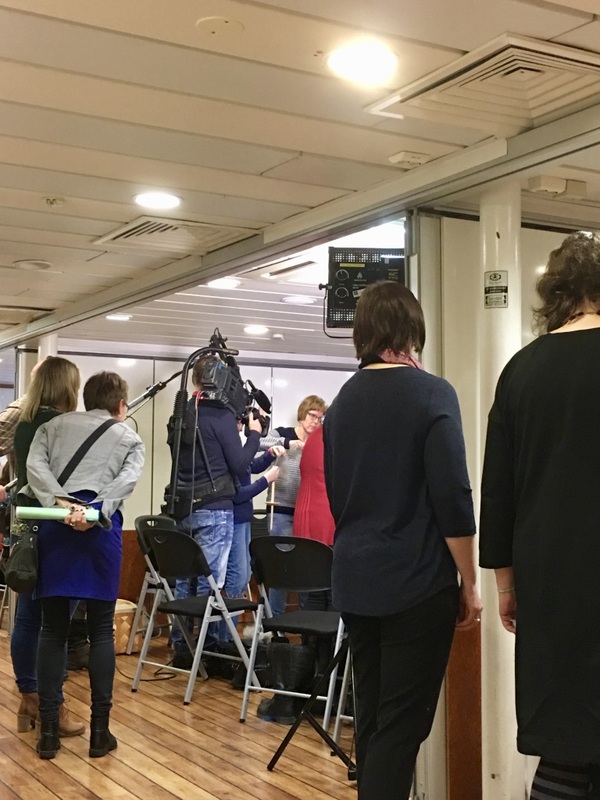 TV camera and microphones, and a bunch of people watching when you drop the spindle… I pitied those brave ladies, they performed well considering the circumstances! After the shopping and walking about for a while to look at the workshops I started to get restless with nothing to do, so I sat down in Limmo-Design’s booth to spin for a while. As it happened, I spun much longer than I had intended: I fell in love with the Schacht Sidekick! Lillemor had drum carded lovely batts that were so easy to draft, so I spun an effect yarn with a longdraw and thoroughly enjoyed myself. Lillemor is a Schacht dealer in Sweden. Tuulia and her assistant before the rush began. 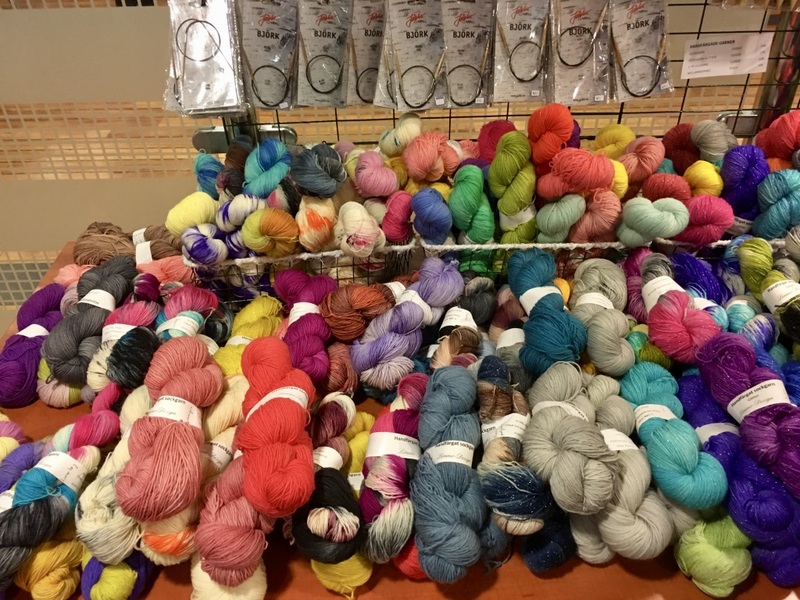 It’s not easy to walk past all those beautiful skeins and balls of yarn! All are high quality yarns dyed by skilled dyers. And, what makes me very happy, most of the sock yarns are thin. That suites me, as I wear woollen socks in my trainers and sandals. 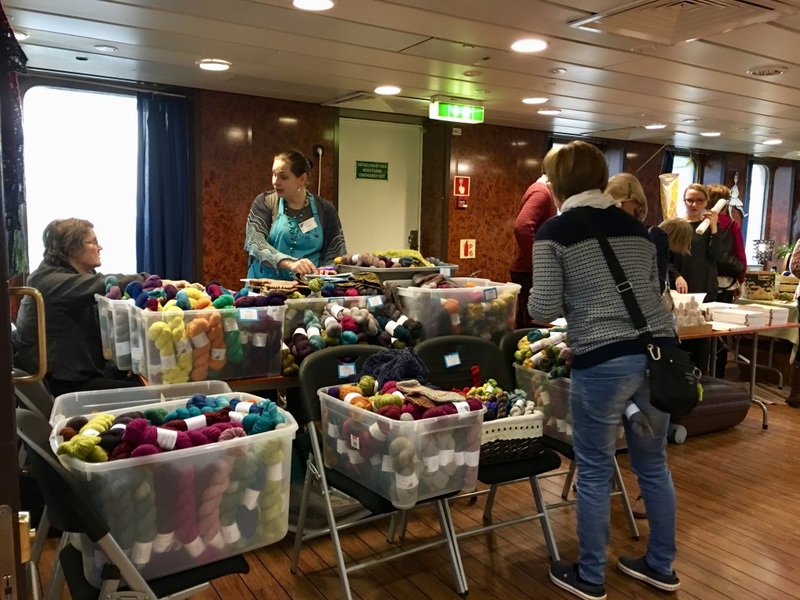 So this was the first craft festival on the ferry. I heard several people talk about “next year” even before we left the ferry. So it was a success! 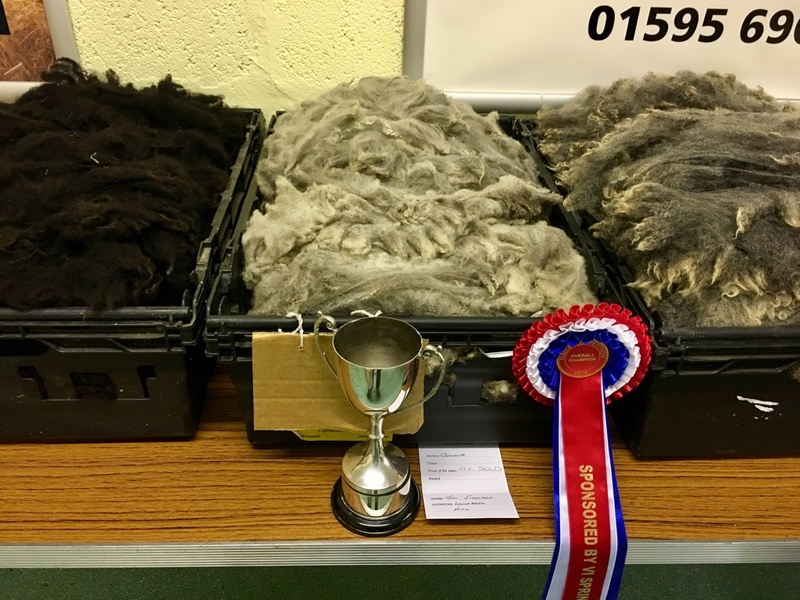 This is my last post about Shetland Wool Week 2016. You may have noticed: no classes for me during Wool Week! It’s partly a choice, and partly because I couldn’t manage to book the classes I wanted to. Shetland Wool Week is booked through a system called Box Office. While I was learning how to use it, all my classes went into a black hole called “sold out”! Kerstin got the same result, so for a moment both of us where a bit dumbstruck. So what to do? Take tours, go to free events, have fun. That’s what Kerstin and I did, and wow what a week we had! Afterwards, while writing these blog posts, I was wondering how on earth we had time to do all we did. 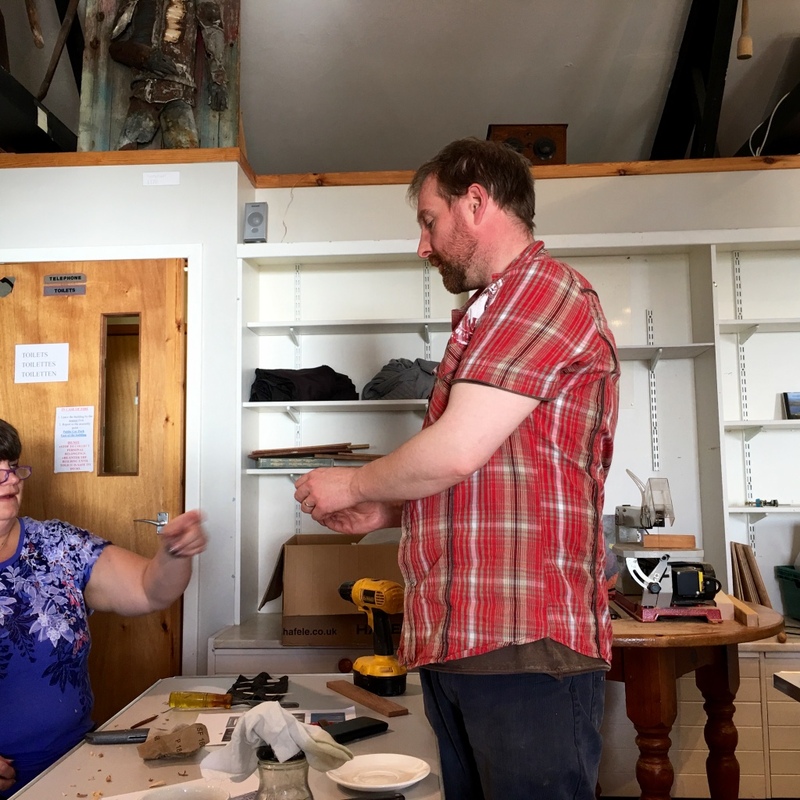 This last post will take you to the Shetland Flock Book Show and Sale, and to the one class I succeeded to book. Kerstin and I wanted to go with our friend Sarah Jane to see more of Shetland sheep, and in the end everyone from our self catering ended up at Shetland Rural Centre just outside Lerwick. 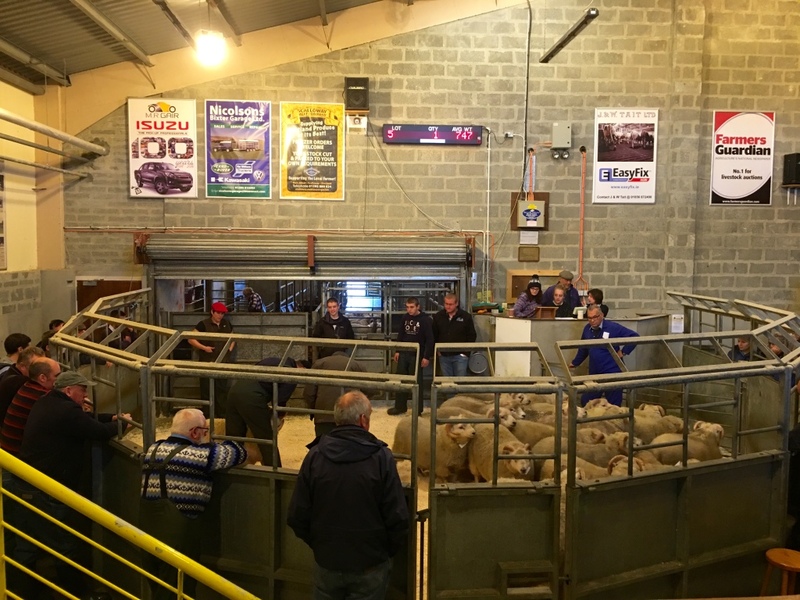 We went there on Saturday when the rams were shown and later sold at the auktion. Sarah has Shetland sheep at home in the US. and she was able to go behind the scene to follow an expert, while Kerstin and I were led to the show ring by Oliver Henry himself! I think he wanted to get us out from behind the scene where we had accidentally gone in the wake of Sarah. 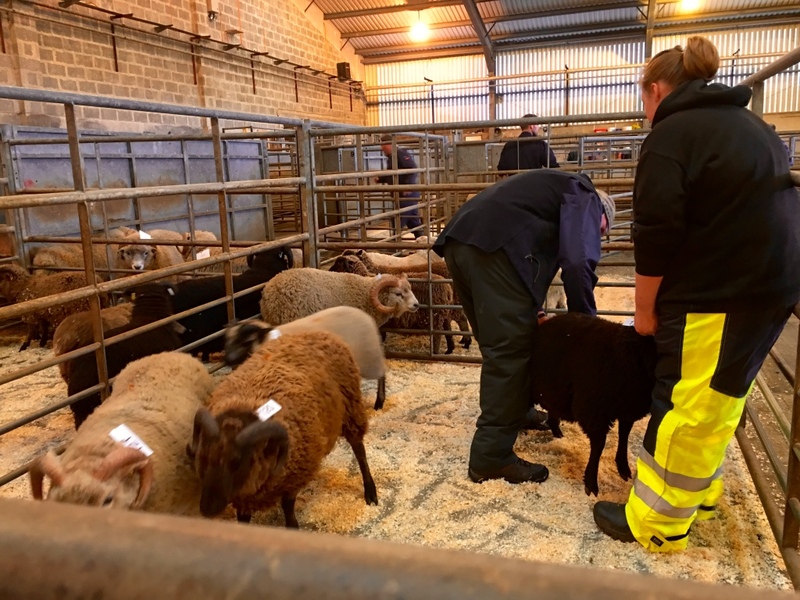 After all the pointing at and moving the rams, some of them were let out to the left, and some back through the door in the middle where they had been let in. The latter group had then been decorated with rosettes in different colours, which tells me they had won a prize of some sort. I suppose they were sold at the auktion later. 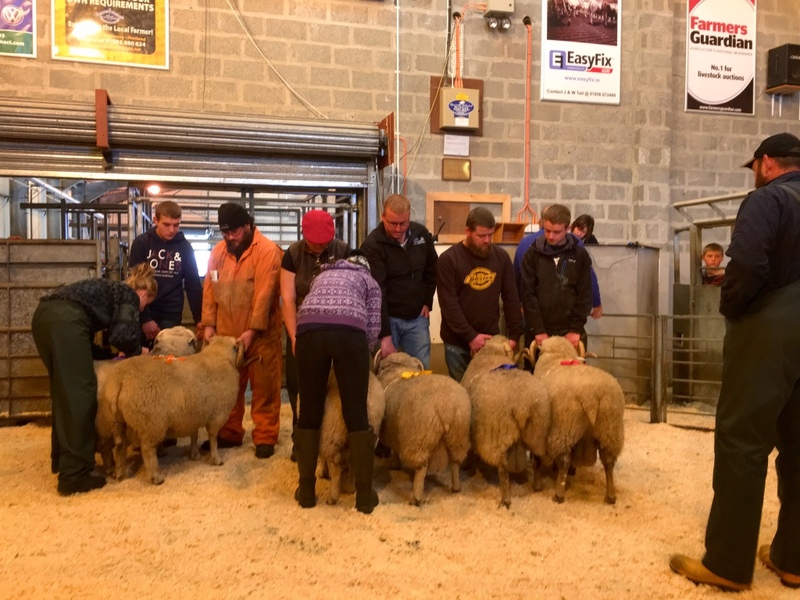 These rams will be used in breeding programs. The photo shows the typical tails of a breed belonging to the group Short Tailed Northern Sheep. The rams came into the ring in groups: young white, young coloured, older white, older coloured etc. Kerstin and I left after a couple of hours, because the show went on until late in the afternoon. The only class I could get a ticket for was a woodworking class for Cecil Tait from Paparwark Furniture. 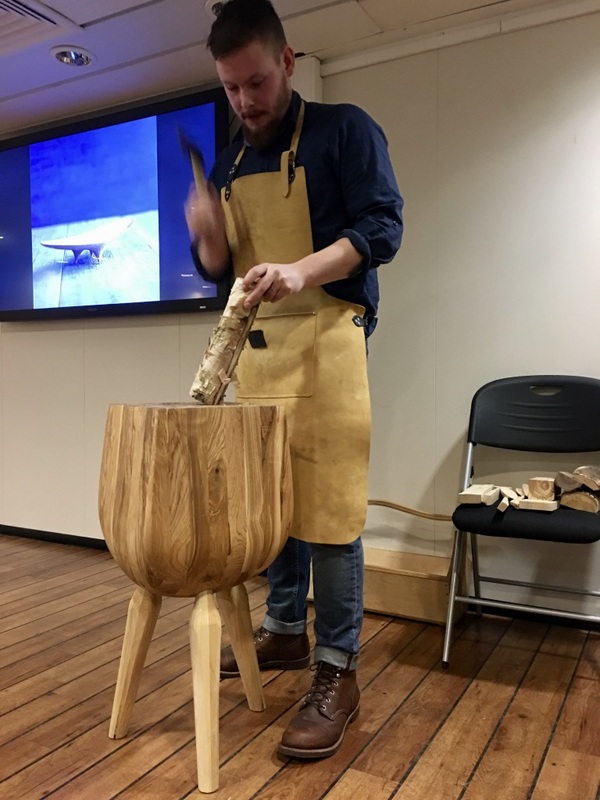 He makes beautiful furniture and household items. I’ve looked at photos on his site for a few years now, and wished I was rich. 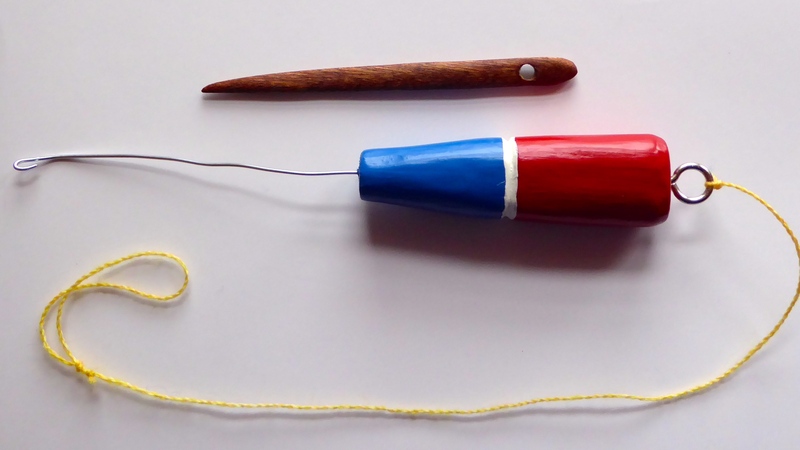 So taking a class for him in how to make my own threading hook and nalbinding needle felt like a real temptation. I was a bit afraid I’d have to use an electric saw, and so it happened. First my father and later my husband both forbid me to use their saws because I break the blades. I told Cecil about it when he wanted me to make my piece of mahogany a bit smaller before I started working on it with a knife. 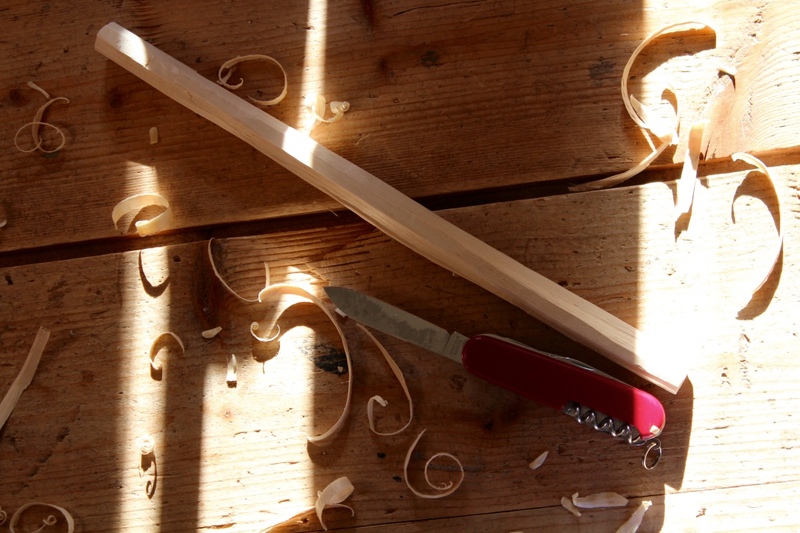 He didn’t believe me, so I breathed in some courage and went to the saw – and broke the blade. You can see the scary saw to the right behind Cecil. 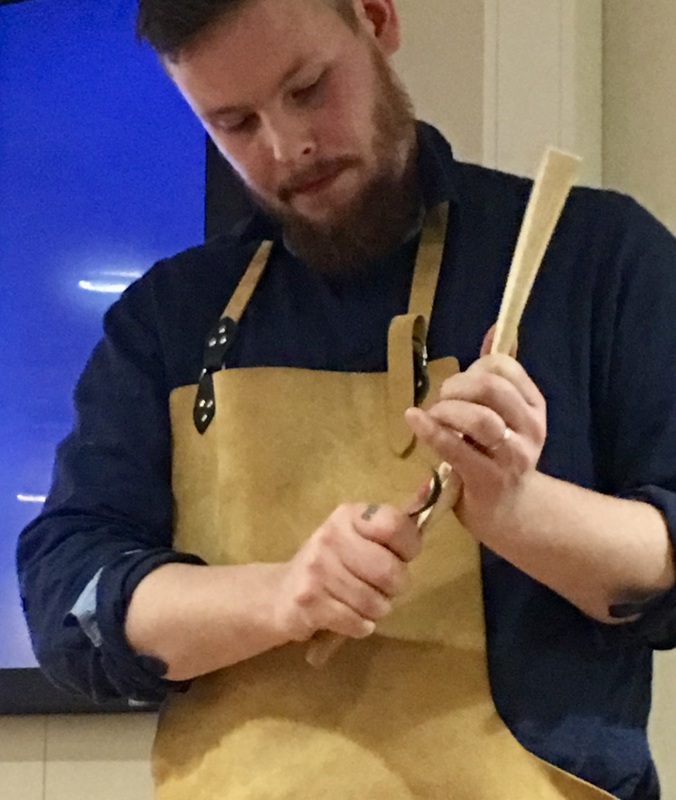 He looked a bit confused, but changed to a new blade (which the others in the class used without any flying pieces of blade), and then handed me the biggest knife he had taken to the class, a beautiful Norwegian Brusletto. Oh how right it felt in my small hand! Yes, I’m serious! 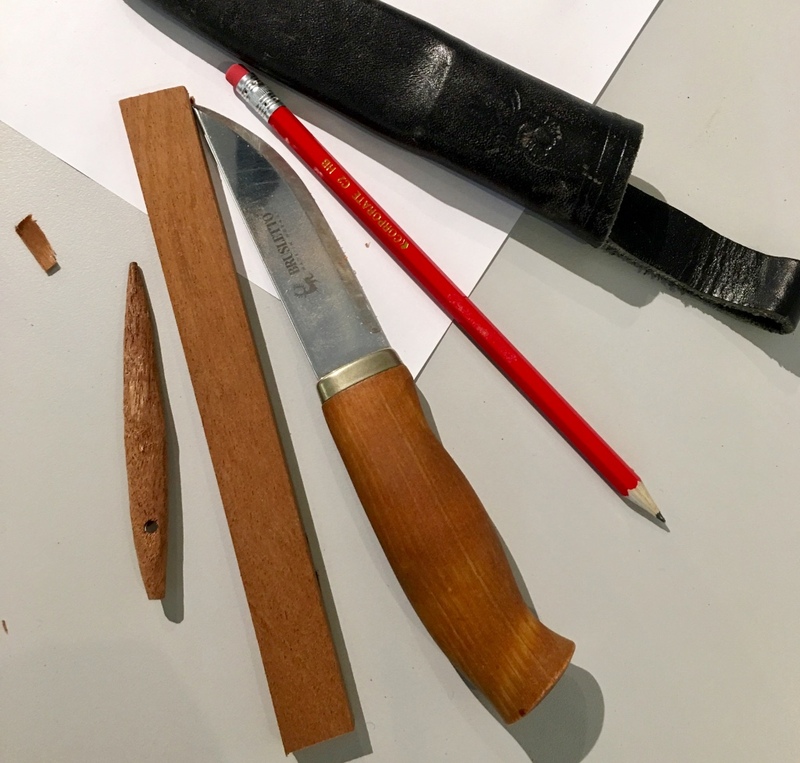 I love to work with knives. And I didn’t have to go near the scary saw anymore. I wasn’t able to finish my hook shaft and needle during the class, but finished them after I came home. 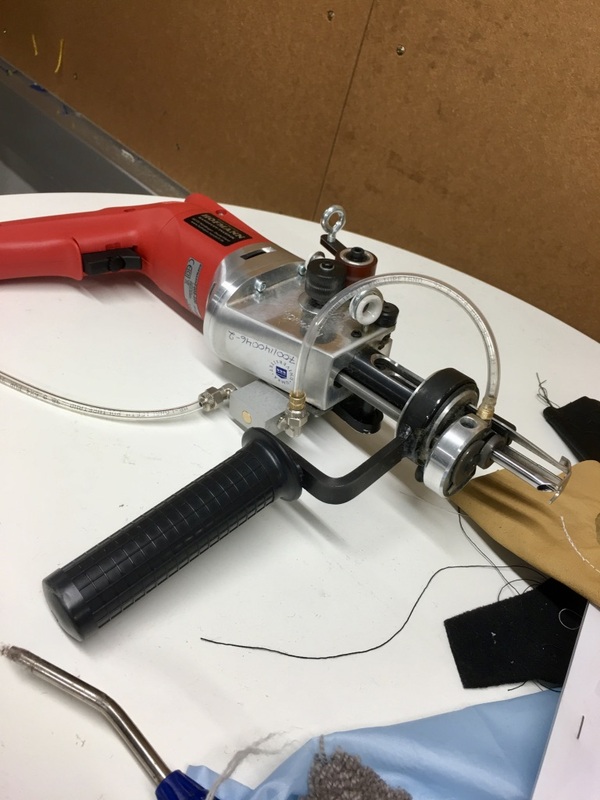 Cecil drilled a hole in my needle, and a much smaller hole in the shaft for the hook. I already want to go back to Shetland. It mustn’t be during Wool Week, it could well be one of the textile tours the islands offers, or I could go with hubby and some friends. There’s so much I didn’t see during my two trips to Shetland! I’d like to sit down in the library and look through their textile books, go to Sumburgh and see the nature centre, and to Ninian’s Island, do some beech combing, go to Eshaness again, take a sea tour and see the bird cliffs again, take a croft tour, see the museums I haven’t had time to see yet, go to Fair Isle and Foula. And much more, like eating at some of the nice restaurants, which Kerstin and I didn’t have time to do during our busy week. Believe it or not, but I lived mostly on boiled eggs and good English ham and cheese and Swedish yoghurt the whole week. Only one evening did Kerstin, Veronica and I have time to go the Chinese restaurant just round the corner: lovely fish! Don’t worry, I’m here! 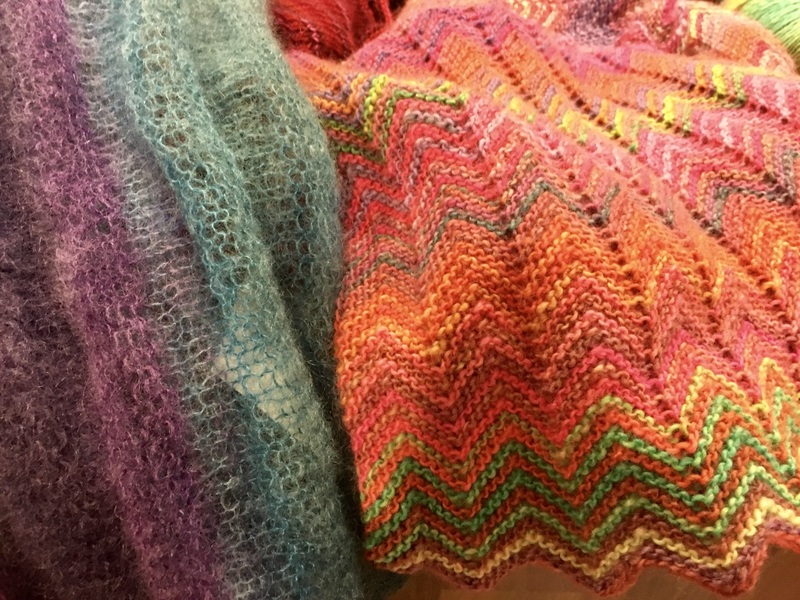 I have been dyeing wool, and I’m not finished yet. I’ll show you later. Today I want to show a spreadsheet from the 19th century. 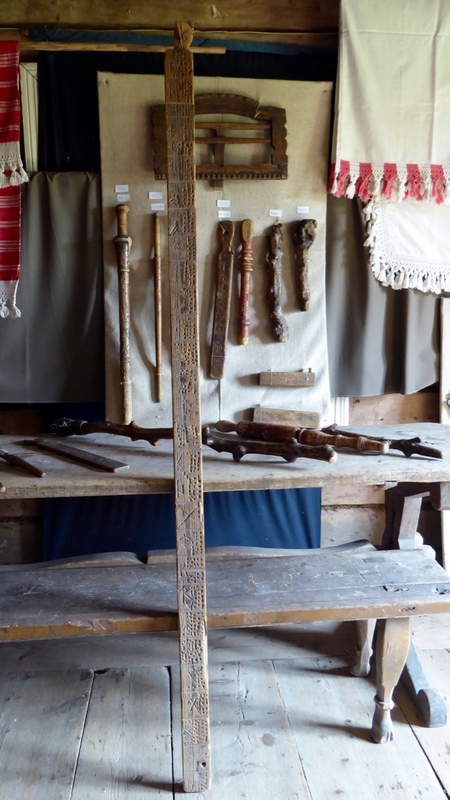 It was used for keeping count of the work that was done by day workers on a farm here in my municipality. 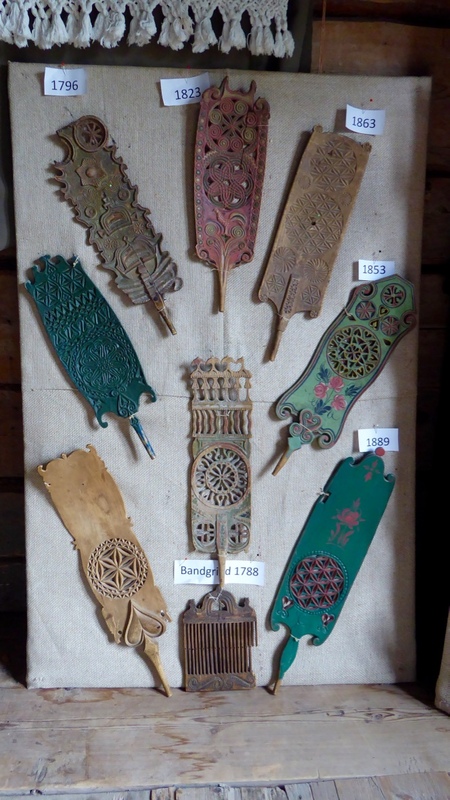 The odd looking pieces of wood on the table and the wall are bidding sticks, older times telephones. 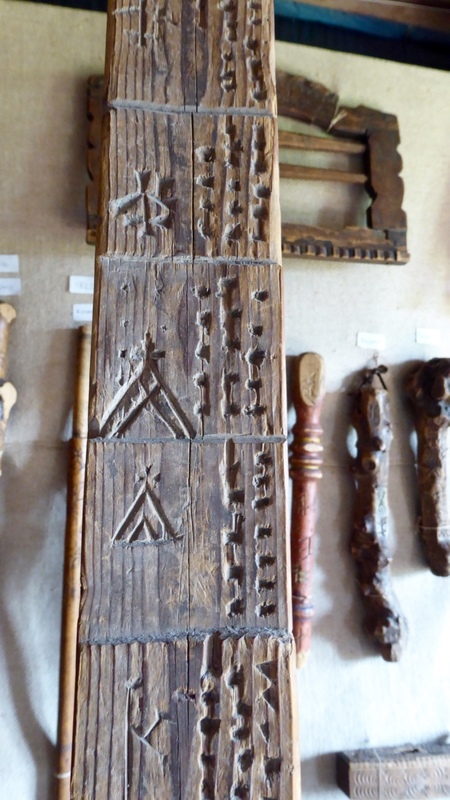 When something alarming or urgent happened in a village, the stick was hastily passed from house to house together with the message. These are small local sticks. The object hanging above them is a book support. The book in this case would’ve been a Bible. To the left the worker’s mark, then the amount of days done. I don’t know what the different signs indicate. The objects are from this summer’s exhibition at our museum Myrbergsgården. The textiles show examples of a kind of lace that was common in many parts of Finland. I don’t know the English term for it. If someone knows, please let me know! 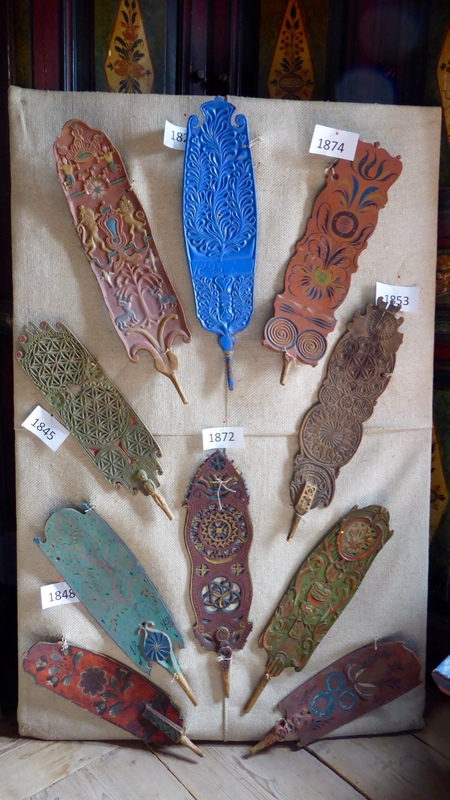 There are also a few beautifully worked distaffs. 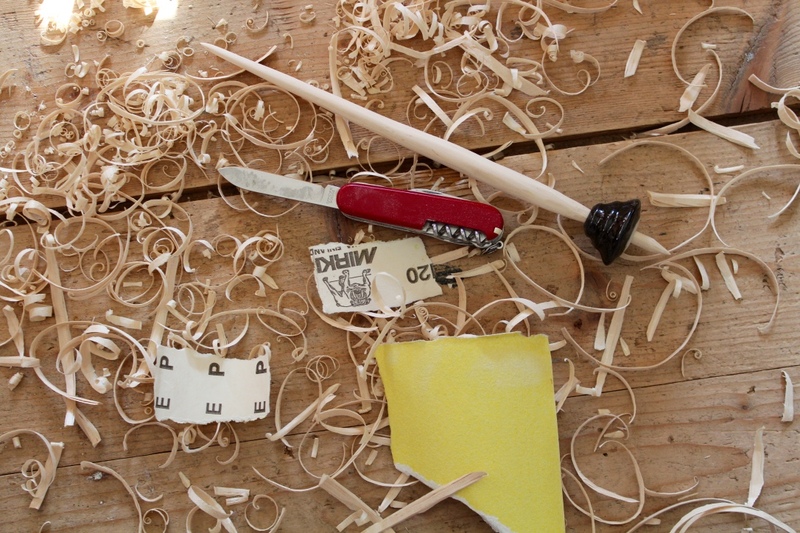 Talking about marks on wood: our dog Kasper is a carpenter. He slowly makes a piece of wood disappear. 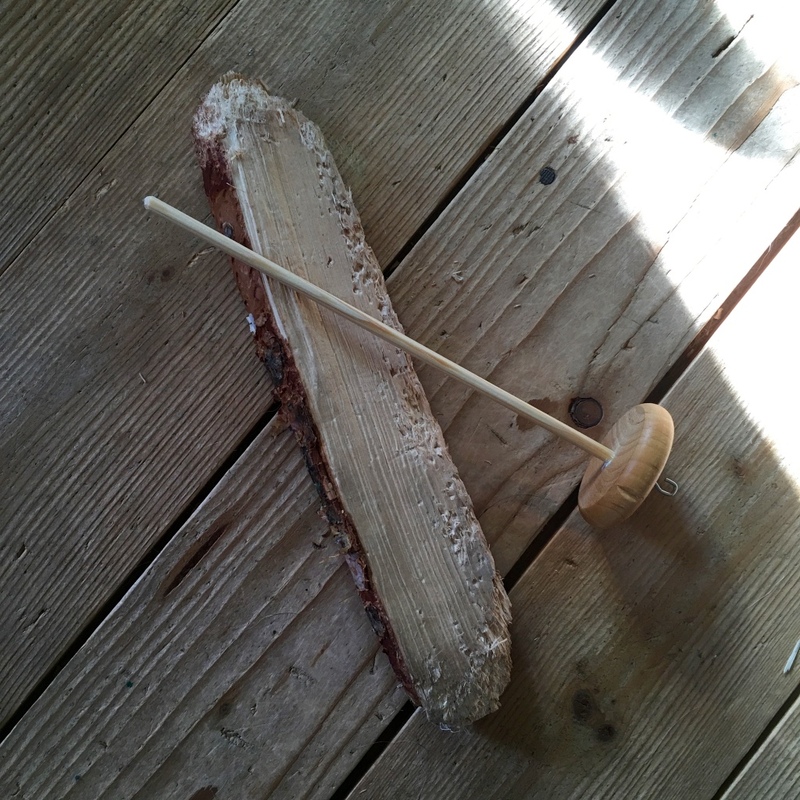 A couple of days ago he took a spindle from my box of class spindles and carefully put it on top of his latest work. I wonder what he thinking? This used to be my grandmother’s salt bowl. She kept sea salt and a stone to crush it with in that bowl. It was in my parent’s cellar for decades, until my brother found it and asked if I wanted it. Of course I wanted it! It was in bad shape, dry and dirty, but it stirred a memory: I knew I’d seen that bowl long ago. My brother also found the stone. I think it’s from the Gulf of Bothnia. The people from my grandparents village used to go fishing Baltic Herring in the autumns, when the fish has the best quality. They then salted it in big barrels. You can see one in the right upper corner of this photo showing a fishing boat that was typical for the coast of Ostrobothnia. 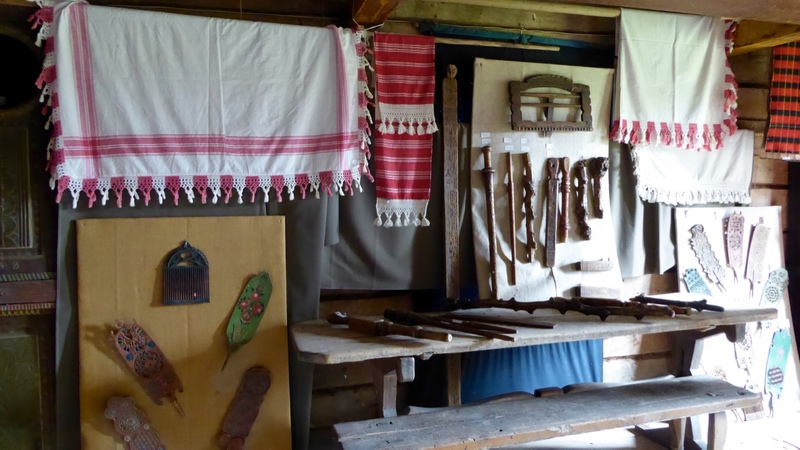 There’s a fantastic museum in Malax: Kvarkens Båtmuseum. I didn’t do anything to improve the bowl for many years. One evening when I was feeling bored and didn’t want to knit, crochet, or spin, I took linen oil and thought I’d fix the bowl. Was it thirsty! Oh my, it drank half the bottle of oil in a blink, and then I hadn’t even started with the bottom. I left it to dry for a couple of weeks, and then tried bees wax and canola oil. The bowl loved it, and all of a sudden there was a shine to the wood, and you could see wonderful details that had been hidden. I love this bowl! It sits on a small table next to my chair. I keep small things and my big note book in it. I love the note book cover just as much – my brother made it for me. The beauty of everyday things! My caffe latte mug is from Iittala, the café au lait cup is handmade and a gift from a spinning friend. The wool i Grå Trøndersau, an extremely rare Norwegian breed that was thought to be extinct until a flock was found in the 90s. The breed has very fine and soft wool. The sample I have is also short, 2-3 cm, so carding and spinning on a supported spindle is the best way to spin it. Long draw on a walking wheel or Saxony wheel would also work fine. 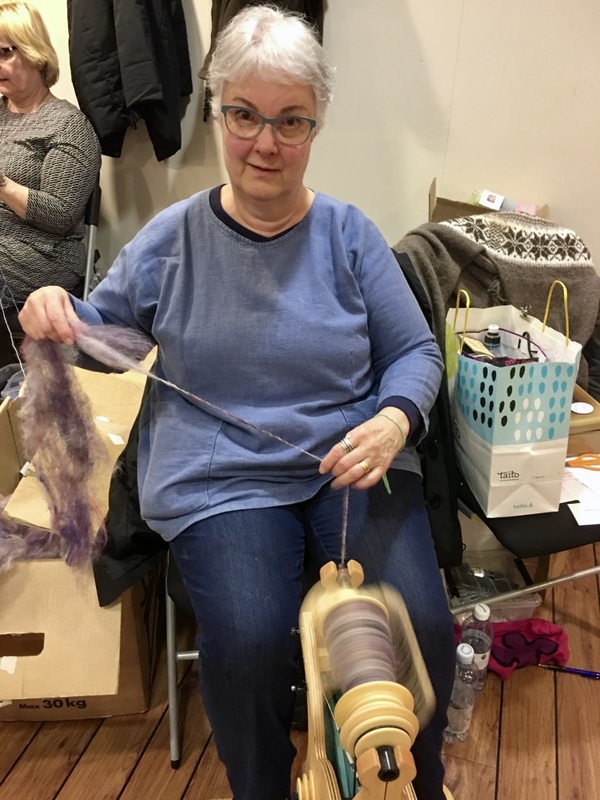 I found the lovely spinning bowl in IST’s booth at Woolfest some years ago. First you go out and find a piece of wood in the fire wood shed. This is birch. It has been drying for a year. Then you test spin. I shortened the shaft to 27 cm, which is suitable for me as I’m a short person. I also made the shaft thinner. The result is a spindle I probably will use very much, as it spins very well. This is the first whorl formed like a cone in my spindle collection. I now understand why they have been so common in many places all over the world: they spin fast and long. 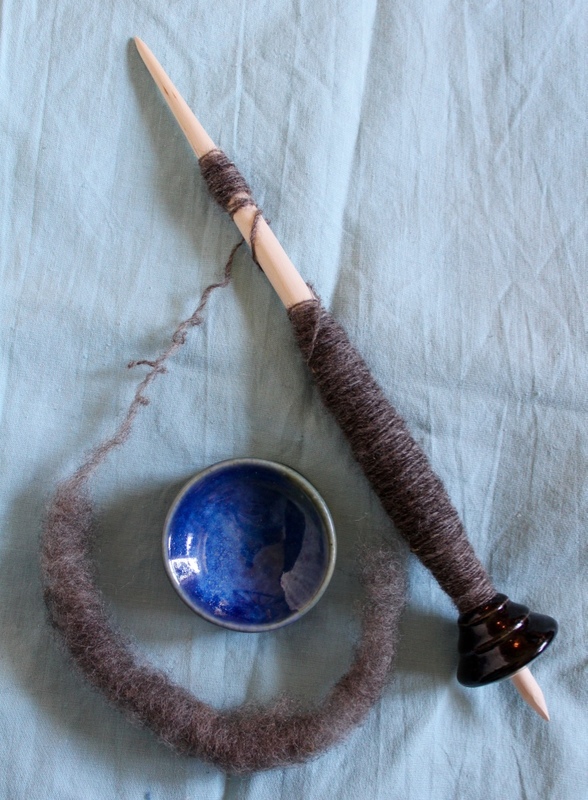 My whorl weighs 35 grams, a good weight for the short and fine wools I often spin. I bought the whorl here: Rostocks keramik. Lena doesn’t sell them in her net shop, but you can contact her to see if she has any in stock. 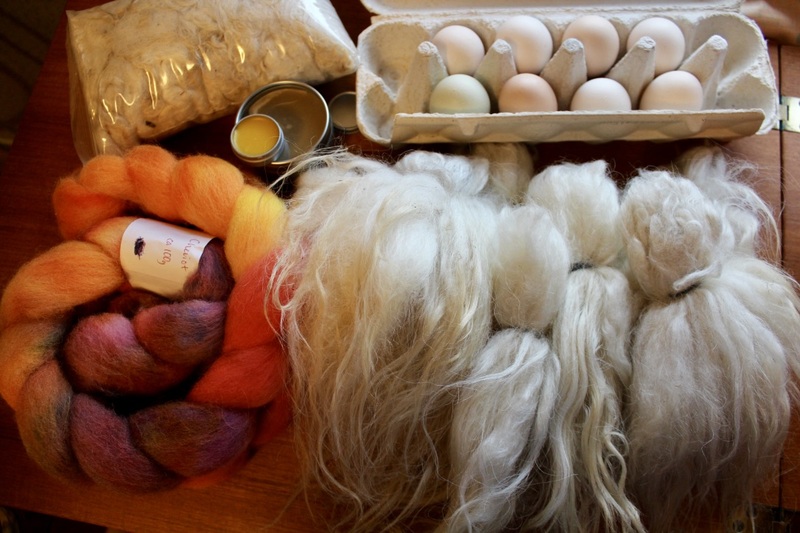 The Swedish spinners were excited, so she sold a whole lot of whorls in a couple of days. There are so many items made with care and accuracy in our world. 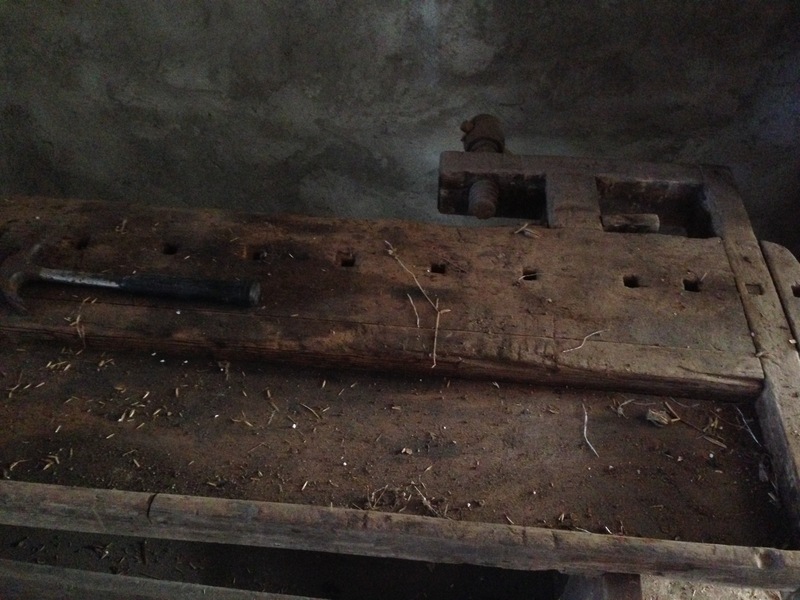 This saw bench hasn’t been in use for many years. There it sits in an old barn, waiting for what destiny will bring. It looks like a painting, I love the colours. Hubby will bring the bench home, and hopefully use it also. He’s a carpenter, among many things. 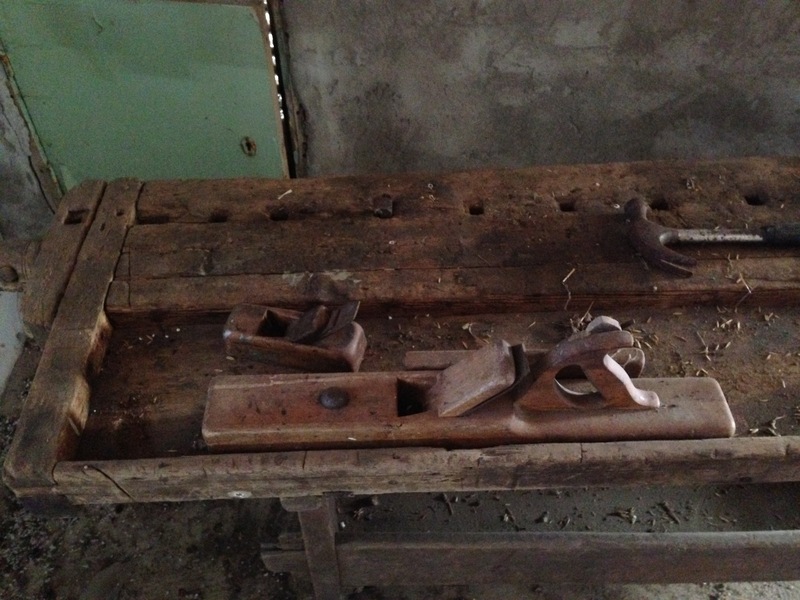 Planes and saw benches aren’t made like that any more. Oh yes, they are just as good and often better, but there’s something very special with old tools that have been used and taken care of. I always feel sorrow when I see them abandoned like this, when the last owner has been in the grave for a long time. I think they have a soul. They wait, they hope. Barbro Heikinmatti on Still here!